We have some good news for low-power AMD builders this morning: AMD has (finally) begun to sell the 35W versions of their "Bristol Ridge" desktop APUs. Overall the company has released 3 35W retail Bristol Ridge SKUs, the A12-9800E, A10-9700E, and A6-9500E, with these chips fleshing out the low-power segment of AMD's AM4 platform through the end of the year. AMD originally released its Bristol Ridge A9000-series APUs to OEMs in mid-2016, targeting desktops and laptops. The SoCs integrate one or two Excavator v2 modules (two or four x86 cores in AMD’s nomenclature), a Radeon R5/R7 iGPU featuring AMD’s GCN 1.2 (3rd generation) architecture and up to 512 stream processors, a dual-channel DDR4 memory controller and so on. Earlier this year AMD finally decided to release a rather broad lineup of its 7th-generation A9000-series APUs on the retail market, enabling end-users to build their own inexpensive AM4 systems, essentially popularizing the AM4 ecosystem compatible with the company’s latest Ryzen processors in general. The originally planned retail lineup for Bristol Ridge included 11 SKUs with a mix of 35 W and 65 W TDPs, but until now, only select 65 W SKUs were available. In the meantime, the interest towards inexpensive Mini-ITX systems is high these days. AMD spent a little over a month after the formal introduction of the family to bring the 35 W A12-9800E and A10-9700E APUs to store shelves. In the last days of August, the new chips hit store shelves across the world: they can be purchased in the U.S., Europe and in Japan, a clear indicator that they are indeed available broadly. 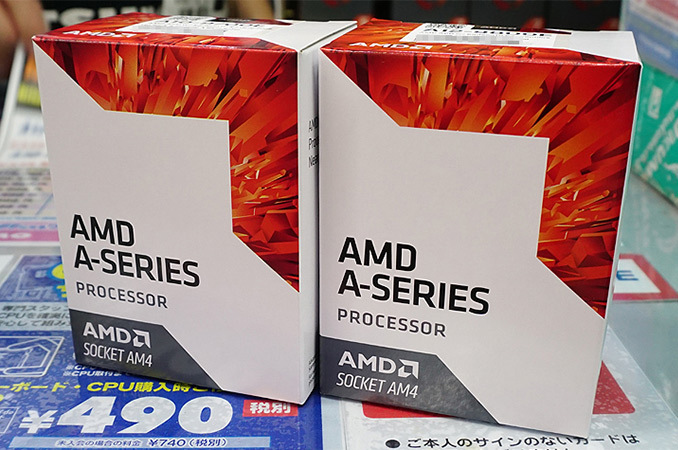 The AMD A10-9700E costs $85 – $91 in the U.S., whereas the more advanced AMD A12-9800E is available for $105 – $113, depending on the retailer. Meanwhile, the A6-9500E, the most basic 35 W Bristol Ridge APU, can be purchased for around $55 – $58. In Europe and Japan, prices are traditionally higher, see the table below for details. Overall, the 35 W APUs from AMD do not look very affordable, but it is typical for chipmakers to charge extra for energy-efficient parts. *Lowest price according to Hikaku.com, or according to AKIBA PC Hotline. From AMD’s standpoint, the main purpose of Bristol Ridge CPUs and APUs is to fill the gap in the AM4 lineup before the company releases Raven Ridge APUs and cheap CPUs based on the Ryzen microarchitecture later on. Sources: Amazon, Amazon UK, Caseking, Newegg, AKIBA PC Hotline, Hikaku.com. Image Source: AKIBA PC Hotline. The CPU performance is a major bottleneck for Bristol ridge. The L2 of Excavator core are just too small for today standard. Any improvements by the faster GPU and DDR4 RAM support are negated by the change from Steamroller(Kaveri)->Excavator(Carrizo/BR). On some cases, the IPC gets a big hit and it is even slower than Trinity running at the same core frequency.